1) To enhance students career preparedness with interactive sessions led by industry professionals. Opportunities to learn about jobs, both in front of and behind the camera, in the media industry. Learning how to transition and brand yourself from student to professional. Strategic communication and networking etiquette. 2) To provide students and professionals with an opportunity to network. Representatives from ESPN, WTNH News 8, HPATV, PROSEK, Gem Advertising, Mackey & Guasco Staffing, Metlife Stadium, and Source Marketing were all in attendance… Along with, of course, Aced My Interview. Aced My Interview was fortunate enough to be invited back for the second consecutive year, and let me tell you, things were even better the second time around. We set up two secluded rooms with IPads, and one by one, students took their turns experiencing a sort of “rapid fire” type of interview. 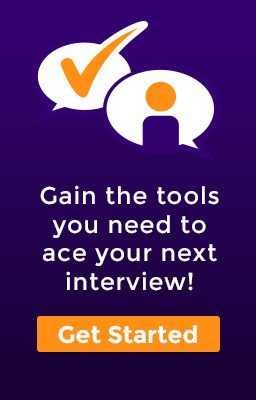 Typically in a mock interview session, the interviewee is given a 30 minute mock interview where we really dive deep into their strengths and weaknesses to give the best constructive criticism possible. 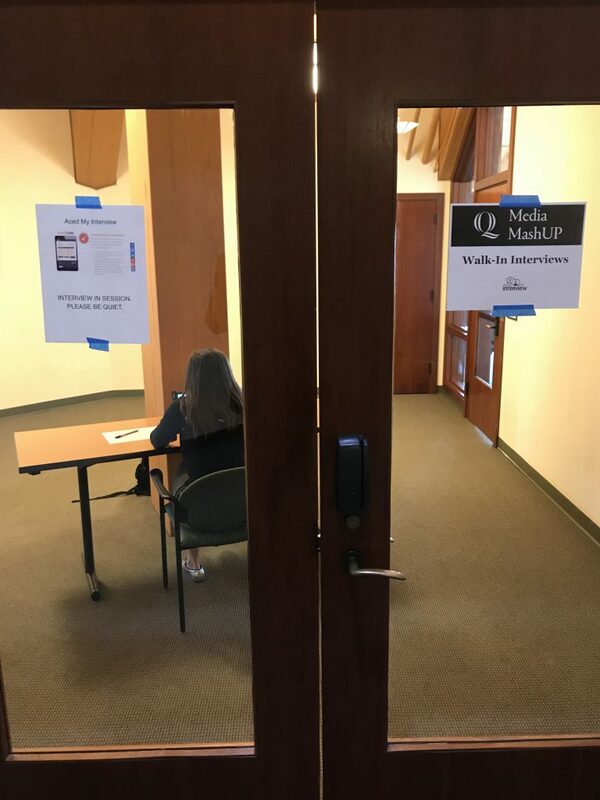 Due to time restraints and amount of students, the mock interview sessions were scaled down to 5-7 minutes, but that doesn’t mean the results weren’t still the same. 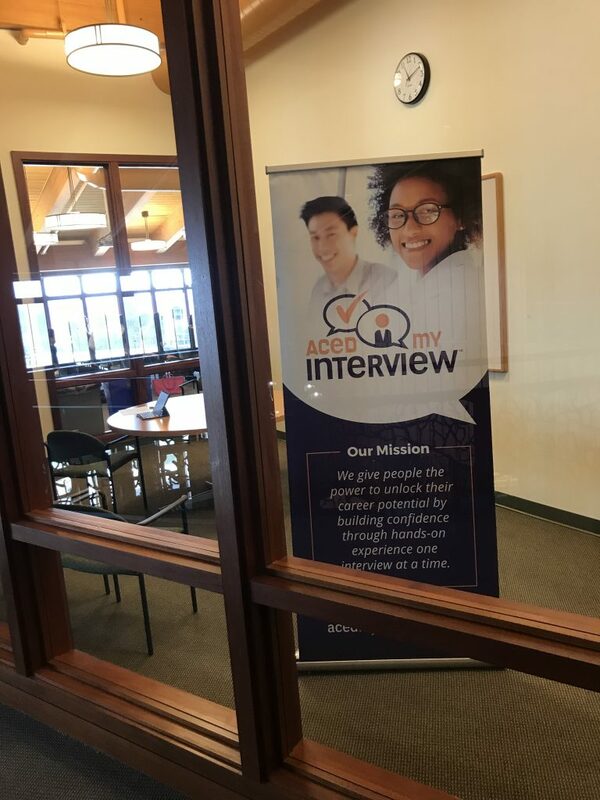 The students not only loved it, but many inquired about more information on how they can go about taking a full mock interview! The sky is the limit for those who put in the effort! It was a pleasure representing Aced My Interview with Quinnipiac University, and we look forward to working with them in the future. “I was so nervous walking in, but after taking the session, I feel much more comfortable with my interviewing skills. I feel like everyone should have the opportunity to experience what you guys have to offer.” – Alexis Konstantakis Senior, Advertising Major. “I honestly didn’t know what to expect. I’m applying to a bunch of places in California so I’m pumped I got my first experience with a virtual interview over with. I feel a lot more confident for graduation now.” – Julia Prescott, Senior Business Management Major. Subscribe to blogs, updates, exclusive resources, and current events! Give your favorite grad the perfect gift to ace their upcoming job interview.